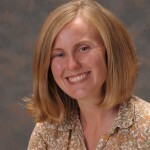 Written by: Lynn Sosnoskie, Weed Science Extension Specialist, University of California. Direct competition with fruit trees for needed water and nutrients during the growing season. Interfering with irrigation by affecting the sprinkler pattern, causing uneven or inefficient irrigation, or by plugging sprinklers. Providing habitat for insect pests, disease pathogens, and tree-damaging rodents (meadow voles, mice, etc.). Inhibiting worker and machine access to trees or increasing safety concerns (e.g., dangerous for ladder work). Figure 1. Hedera helix, a.k.a. English ivy. How do we define weeds? 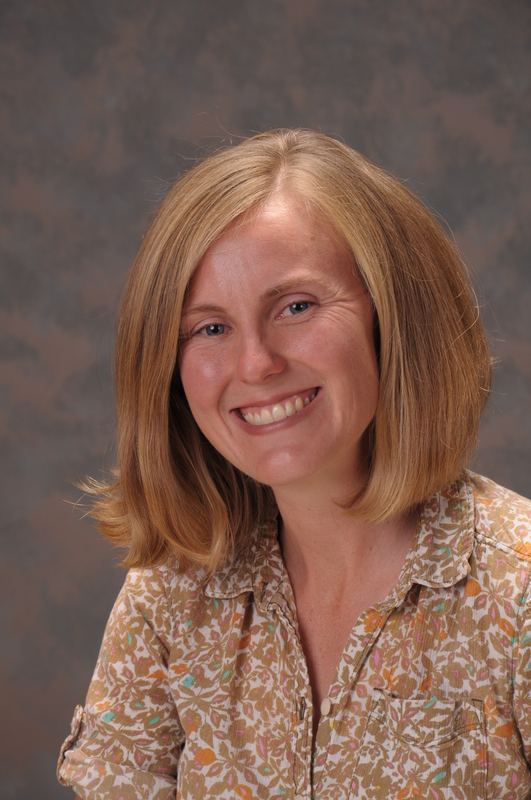 The first step to controlling weeds is to understand their origins, their biology, and their evolution in agricultural and horticultural ecosystems. The term ‘weed’ is typically applied to any plant that is ‘unwanted’ and is ‘growing out of place’. 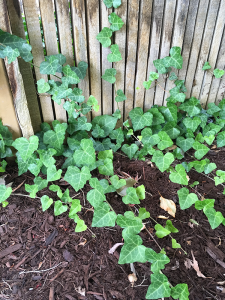 It is important to note that the concept of a weed can vary in response to each person’s opinions about a given plant; a homeowner may love the aesthetic that English Ivy (Hedera helix) provides in their own backyard whereas a city manager may abhor it climbing across buildings and over street signs (Figure 1). It is typical, however, to classify species that are an economic, ecological, or health (to humans and animals) threat as being a weed. While the general definition of a ‘weed’ may be open to personal interpretation, other descriptors are grounded in details of a species life history traits, growth forms, and where it comes from (origins). Figure 2. 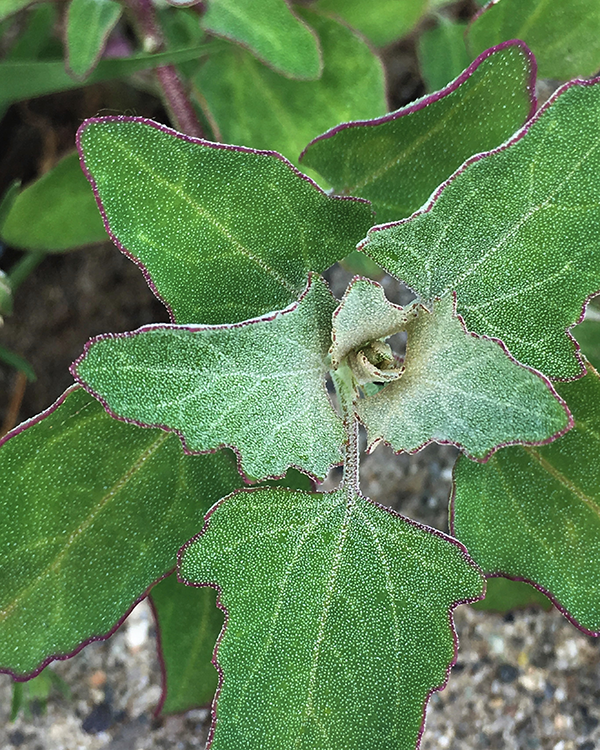 Chenopodim album, a.k.a common lambsquarters, is an example of a broadleaf weed. Annual weeds –Annual weeds complete their life cycles (germinate, grow, reproduce, and die) during a single year. This category is often sub-divided into two groups: the summer annuals (weeds that germinate and grow in the spring and the summer. e.g. common lambsquarters – Chenopodium album; Figure 2) and the winter annuals (weeds that germinate and grow in the fall and the winter. e.g. common groundsel – Senecio vulgaris). 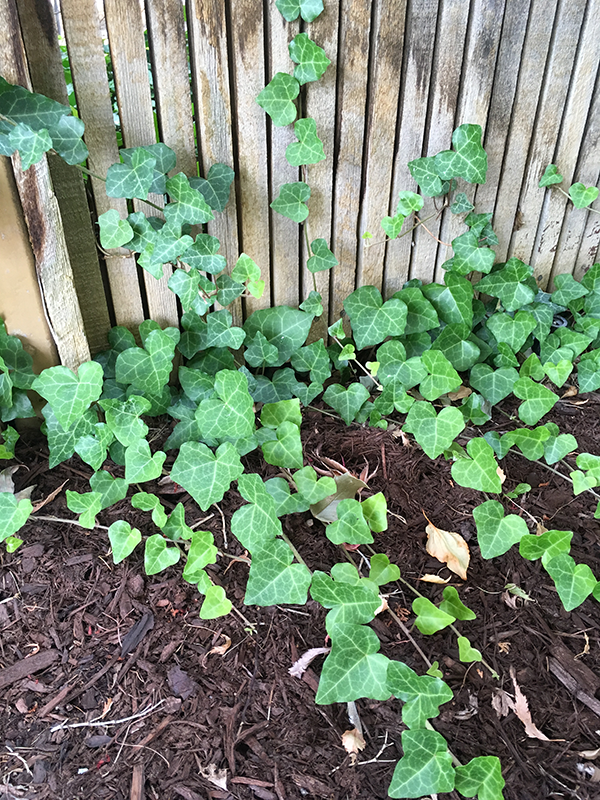 Biennial weeds – These plants have a 2-year life cycle. They germinate, emerge, and (typically) form a rosette in the first year. During the second year, the plant produces a flower stalk, flowers, sets seed, then dies (e.g. wild carrot – Daucus carota). Perennial weeds – Perennial weeds have life cycles that last three or more years. Some perennial plants (simple or solitary perennials) reproduce only by seed (e.g. dandelion – Taraxacum officianale), while others (spreading perennials) may also proliferate via rhizomes, stolons, and tubers (e.g. field bindweed – Convolvulus arvensis). Figure 3. Digitaria sanguinalis, a.k.a. 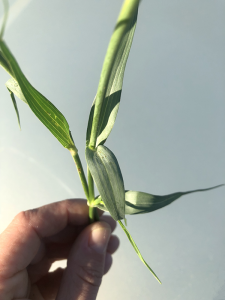 large crabgrass, is an example of a grass weed. 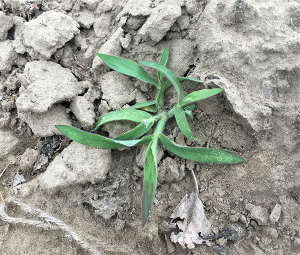 Broadleaf weeds –Broadleaf plants have two cotyledons (seed leaves) as they are emerging. Mature plants typically produce true leaves that are ‘wide’ and that have a main vein in the center with smaller veins that are often branched or net-like (e.g. pigweeds – Amaranthus species). Grass weeds – Grassy weeds have a single cotyledon as they are emerging. Grasses are also described as having narrow leaves with parallel veins and jointed stems (e.g. large crabgrass – Digitaria sanguinalis; Figure 3). Figure 4. The leaves of Trapopogon dubius, a.k.a. Western salsify, look almost like those of grasses. Although these characteristics are generally true, be aware that there are species that do not always appear to adhere to the ‘rules’. One good example is Western salsify (Trapopogon dubious), a broadleaf weed species that has leaves that are very grass-like in appearance (Figure 4). Weeds occur in almost every ecosystem, worldwide, where they can have negative economic (e.g. crop competition), environmental (e.g. reduced biodiversity and increased fire risk), health (e.g. dermatitis and rhinitis), and aesthetic impacts (e.g. obstructed views). However, weeds don’t necessarily originate in the environments where they cause damage; as such, weeds can also be classified as to where they originated, relative to a given location. Native plants – Native plants are species that occur in a specific region and have evolved with the ecosystems therein. The word native is usually used with a geographic or habitat qualifier (i.e. native to western Washington or native to salt marshes in the eastern US). Important note: Native plants can also be weeds! Just because a plant is indigenous to a locality, region, or continent doesn’t mean that it can’t also be a pest plant. For example, poison ivy (Toxicodendron radicans) is native to the northeastern United States, however, it is still considered deleterious and, therefore, a weedy pest. Figure 5. 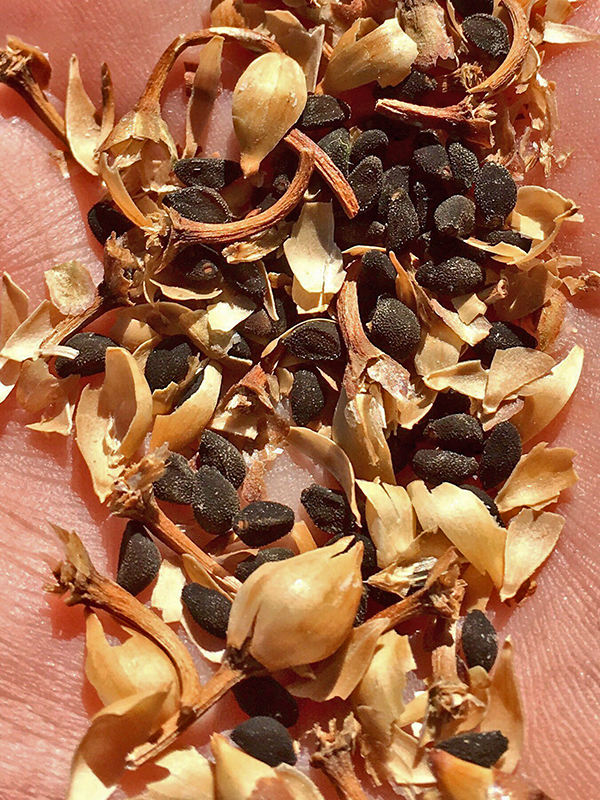 Seeds of Convolvulus arvensis, a.k.a. field bindweed. Non-native plants – Non-native plants are those species that were introduced (intentionally or accidentally) to a new place or habitat. Some non-native species may also be classified as being invasive. Invasive species are often characterized by their rapid spread and subsequent disruption of communities and ecosystems. Important note: Not all non-native plants are invasive. In fact, many non-native plants cannot reproduce or spread readily without continued human help (for example, many agronomic or ornamental species that we rely on for our food). If a plant isn’t native to an area, where does it come from? Do weedy species more frequently originate in one part of the world as compared to others? Weedy species have been shown to come from almost everywhere in the world. However, the migration of humans over time has resulted in certain patterns with respect to origin. According to a paper published in Nature by Dr. Mark van Kleunen (2015, 525:100–103), approximately 4% of the world’s vascular plants have become naturalized in new environments, with North America accumulating the greatest total number of weedy species. How do weeds spread and then persist in a system? Figure 6. 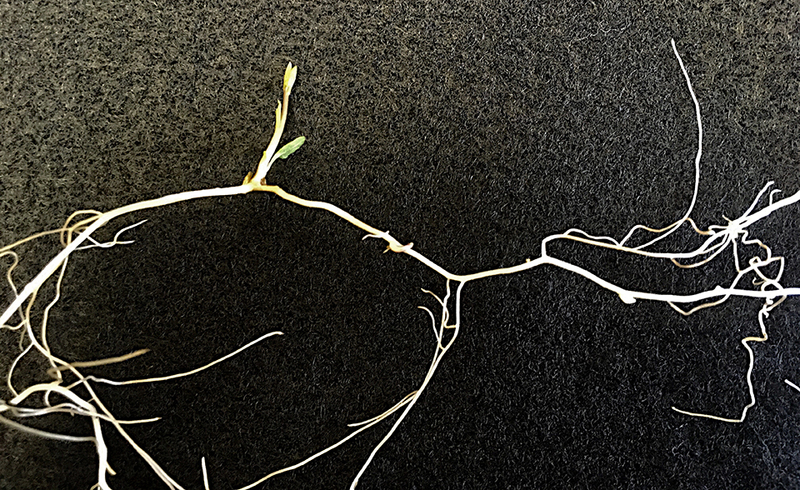 Underground roots and shoots of Convolvulus arvensis, a.k.a. field bindweed. Weeds move between and become established in different locations by the production and dispersal of seeds (Figure 5). Seeds can be spread within and among sites via gravity, wind, water, forceful expulsion, or through the movement of animals and people. Seeds that are released from the parent plant enter the soil seedbank, where they can remain for varying amounts of time (e.g. some seeds are very short-lived and may persist for only a couple of years; other seeds may remain dormant for years or possibly even decades). Weeds may also spread via the movement of vegetative structures, such as bulbs or rhizomes. For example, Field bindweed (Convolvulus arvensis) is a perennial vine that produces an extensive underground root system (Figure 6). 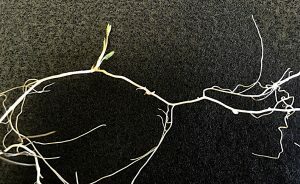 Cultivation can break up this network and distribute root pieces and rhizome fragments across a field or between sites. Weed control successes and failures may be reflected in changes that occur to this reservoir; in good years, weeds are successfully controlled and few to no seeds may enter the seedbank. In bad years, when weeds escape management strategies, rogue plants may flower, set seed, and contribute to this genetic stockpile.